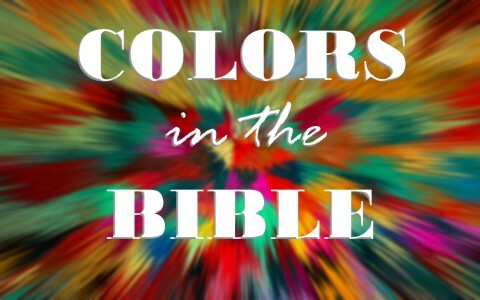 Do Colors Have Special Meanings When Used In The Bible? What are the significances of the colors in the Bible? Do they have a special meaning? Almost every time I see a rainbow I don’t think of Noah first; I think of God’s promise that “the waters shall no more become a flood to destroy all flesh” (Gen 9:15). Interestingly, the rainbow can appear before, during, and after a flooding rain but never again on the global scale. The rainbow contains every color that has significance in the Bible. Although there is nothing in the color itself, God will sometimes use colors to portray an attribute of God or signify a purpose for accessories of the priestly garments or some other special purpose. From the very beginning, red has been the color of atonement and this atonement is in the form of blood. This one seems very clear if you read where Adam and Eve had sinned and had lost fellowship with God and so “the Lord God made for Adam and for his wife garments of skins and clothed them” (Gen 3:21). This was the very first blood sacrifice to be shed over the sins of humans. God wants us to know that sin is costly; it costs the shedding of blood, even in the Garden, thousands of years before Jesus Christ came to earth to be born as a babe. Christians are aware that “under the law almost everything is purified with blood, and without the shedding of blood there is no forgiveness of sins” (Heb 9:22). Even in relation to human sin, one man’s blood is required if he takes another man’s life (Gen 9:4-6). White clearly represents the righteousness of God and sometimes specifically to Christ’s righteousness. Isaiah wrote “Come now, let us reason together, says the Lord: though your sins are like scarlet, they shall be as white as snow; though they are red like crimson, they shall become like wool” (Isaiah 1:18). The martyrs who had died for their faith (Rev 6:9) were all “given a white robe and told to rest a little longer, until the number of their fellow servants and their brothers should be complete, who were to be killed as they themselves had been” (Rev 6:11) with the white clearly representing the righteousness of Christ (2 Cor 5:21). The Book of Revelation has more about the color white (15) than any book in the New Testament and it most often refers to Christ or an attribute of His (like His hair, Rev 1:14). Only the Old Testament Book of Leviticus has more (16) and this book is predominantly concerned about the priesthood, which foreshadowed the coming High Priest Who abides forever…Jesus Christ. Purple is representative of royalty as this is easily found throughout human history but also in the Bible (Judges 8:26). When Daniel was placed as third in the kingdom of Babylon as when “Belshazzar gave the command, and Daniel was clothed with purple, a chain of gold was put around his neck, and a proclamation was made about him, that he should be the third ruler in the kingdom” (Dan 5:29). When Mordecai revealed a plot to assassinate the king, the king rewarded him, as it was written, “Then Mordecai went out from the presence of the king in royal robes of blue and white, with a great golden crown and a robe of fine linen and purple, and the city of Susa shouted and rejoiced” (Esther 8:15). I don’t mean that the color of prosperity is green, as in greenbacks but I mean spiritually thriving as a plant does near a stream. David wrote “But I am like a green olive tree in the house of God” (Psalm 52:8). God says of the righteous, “They are planted in the house of the Lord; they flourish in the courts of our God. They still bear fruit in old age; they are ever full of sap and green” (Psalm 92:13-14). If you’re planted firmly in the house of the Lord, your sap is full, you thrive being green, and your fruit will bear even in old age. Perhaps that fruit is the fruit of the Holy Spirit which will help believers bear much fruit even into their senior years. You can see how often the color of black is associated with death and darkness (Lam 4:8) that it’s hard to know where to begin in the Bible. Since we know that God is light and goodness (John 1) then the absence of light is dark and death as the prophet Micah describes it, “Therefore it shall be night to you, without vision, and darkness to you, without divination. The sun shall go down on the prophets, and the day shall be black over them” (Micah 3:6). Even the third horse of the Apocalypse was black and spelled bad news for the earth’s inhabitants (Rev 6:5-6). I could not possibly have covered all of the colors and all of their significances in one article. You could write a book on this subject but we do know that the color that you need to know about the most if you have never been saved is red because that represents the shed blood of Jesus Christ Who gave His life as a ransom for many but that blood is useless until you apply it to the doorposts and mantels of your heart. Then God’s wrath passes over you and you will be in the kingdom and see colors and sights so incredible as to defy description. Here is another related article about color for you: What Does the Color Gold Represent? What do the colors represent on a priest robe serving God’s temple please? Hello Maelene. Thank you for your very good question. After doing some research, I discovered that the ephod as a whole, with its different colors and materials, typifies Christ in His high priestly ministry. Christ, the High Priest bears His people upon His shoulders, the place of strength and seat of power. The shoulders also speak of carrying a burden, Christ, the High Priest carries the whole burden alone. The ephod may represent that part of our relationship with Jesus through which we show forth the virtues of our Mashiach. It contained threads of gold, blue, purple, red, and white. These colors and materials represent the various and glorious characteristics of our Lord and are imparted and imputed to us when we are made children of God. They are the same colors that were in the door to the outer court, the door to the sanctuary, and the veil and represent Jesus as He is pictured in the four gospels. The gold implies his divinity. Gold is fitting for a king to and Jesus is our King. Purple means royalty, red was Jesus’ shed blood, and white, the sinless-less of Jesus. hello, i were so enthused to read your introduction and the meaning of the significance of colors. it was very helpful to me. the reading of them was very clear and understanding with the reference of biblical scripture. i would like to receive more biblical input on how to teach or represent this information to my class of students.thank you very much.